Say you have a system for finding and executing stock trades. And maybe that system is working. But if you could make it better, would you? Making it better might mean reducing trade risk, adding theta so the position could decay as time passes if the stock’s price doesn’t move, and maybe increasing the probability of making a profit. Sounds a little like the intro to the TV show The Six Million Dollar Man. 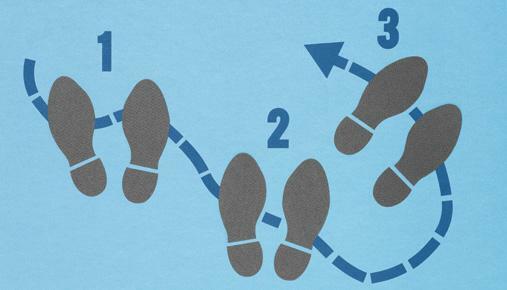 But you don’t need to crash and burn before you try these techniques. It’s not that you have to change how you determine trading decisions. You can keep doing what you do. But you may consider an alternative strategy for those decisions. Every trading choice has trade-offs, whether decreased profit potential or increased commissions. That’s why you should consider all aspects of a strategy. Let’s see how options combine risk, positive theta, and potential increased profit in three scenarios. Yup, a traditional strategy. If you’re bullish on a stock, you buy its shares. If the stock price goes up, you make money, and if it goes down, you lose. Now, you know that if you buy stock, the max you can lose is the price you pay for it. And while stock prices can go to zero, they don’t usually. However, a stock’s price doesn’t have to go to zero to be considered a crash; even a 20% drop could do it. Consider a 20% drop in a $20 stock. That’s $4 and, if you owned 100 shares, the loss is $400. The long 100 shares can also make $400 if the stock price rises $4. So the p/l for a certain percentage price change up or down in the stock’s price is the same. As an alternative to long stock, let’s look at a short put (Figure 1). A naked short put is a bullish trade. You sell an out-of-the-money (OTM) put and take in a credit. Sure, a naked short option sounds risky, and it is, but a short put’s maximum risk isn’t greater than owning the stock. In other words, the max risk on a naked short put is the strike price minus the credit received, and its breakeven point is the strike minus the credit, plus commissions. 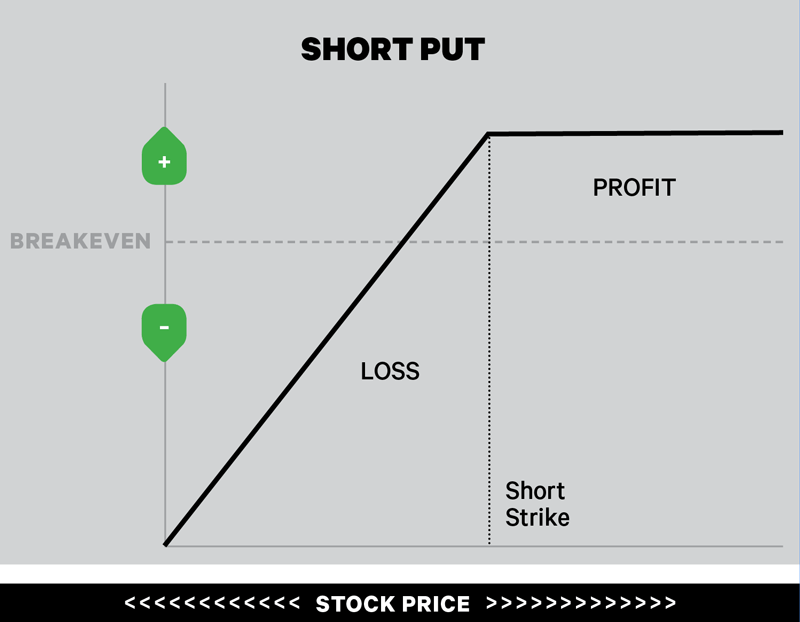 FIGURE 1: SHORTING A PUT. It’s a bullish strategy where a naked put is sold for a credit. The max risk is the strike price minus the credit. You might short a put when you believe the stock could move up or sideways prior to expiration. For illustrative purposes only. For example, if you sell the 18 strike put on a $20 stock and receive a $0.40 credit, it would have a breakeven point of $17.60 with a max possible loss of $1,760 if the stock goes to zero, not including commissions. The long 100 shares you bought for $20 would lose $2,000, not including commissions. If the stock price drops 20% and closes at $16 at the option’s expiration, then the short 18 put would have a $160 loss. The 18 put would have an intrinsic value of $2, but you took in a $0.40 credit. The loss is $2.00 – $0.40 = $1.60, or $160 not including commissions. That’s less than the $400 loss on 100 shares. If the stock stays above $18 through expiration, the short put would still make its max profit of $40, not including commissions. That means the stock can drop from $20 to $18, and the short 18 put can theoretically still profit. Even if the stock stays at $20, all things being equal, the put’s price will erode because of time decay, and you get to keep your proceeds. There’s a wider range of stock prices for the short put to be profitable ($18 and higher) than there is for the long stock ($20 and higher). And that wider range increases the short put’s chance of making money. What’s the downside to the short put? If the stock rallies past $20.40, then the profit on the stock would be greater than the profit on the short put. The long shares theoretically have unlimited potential profit. The short put is also not eligible to receive any dividends, and can incur higher commissions. The naked put strategy also includes a high risk of purchasing the corresponding stock at the strike price when the market price of the stock will likely be lower. If you think a stock’s price will drop, the traditional strategy is to sell its shares short. If the stock’s price drops, the trade is profitable. If the price rises, the trade loses money. The max profit is the stock price itself, which happens if the stock price goes to zero. If you shorted 100 shares of an $80 stock, the max profit is $8,000, not including commissions. However, the short stock position theoretically has unlimited risk: there’s no limit to how high the stock’s price might go. The bearish alternative could be a short call vertical (Figure 2). Sell short an OTM call and buy long a further OTM call in the same expiration, and you receive a credit for selling the call vertical. For example, on a stock trading at $80, a short call vertical might be to sell the 82 call and buy the 84 call for a $0.65 credit. The max profit on the short 82/84 call vertical is your $65 credit. Max profit occurs if the stock closes below $82 at expiration. The breakeven point is the short call strike ($82) plus the credit ($0.65), which is $82.65. If the stock is anywhere below $82.65 at expiration, the short call vertical has some profit. FIGURE 2: SHORT CALL VERTICAL. It’s a defined-risk strategy where potential losses are limited. Your trade will stop losing money when the stock’s price rises above the long strike, but potential profits are also limited. For illustrative purposes only. The max loss is the difference between the strikes ($84 – $82) minus the credit ($0.65), which in this example is $135. This occurs if the stock closes above $84 at expiration. Compare the $65 max profit on the short call vertical to the potential profit of shorting the stock. If the stock price drops below $79.35, the short 100 shares make a larger profit than the short call vertical. But what if the stock rallies, say, 5% and goes from $80 to $84? The short 100 shares would lose $400, and the short call vertical would lose $165, not including commissions. And what if the stock price rose to $82? The short 100 shares would lose $200, and the short call vertical could still make $65. In this example, the short call vertical can profit if the stock closes anywhere below $82.65 at expiration, while the short 100 shares only make money if the stock is below $80. The short call vertical has positive time decay, and can make money if the stock price stays at $80 as time passes, all things being equal. So, in theory, the short call vertical has more opportunity for some profit than the short stock. Just like the bullish short put, there are downsides. 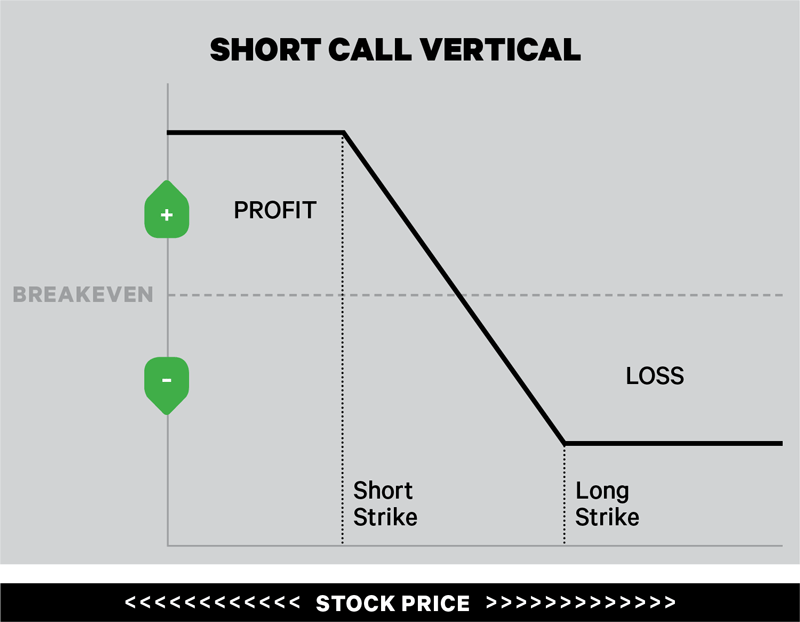 The short call vertical has smaller potential profit and potentially higher commissions than the short stock position. When you don’t think a stock’s price will change, there’s no traditional strategy. Maybe you buy the stock and collect a dividend, but that’s still a bullish trade. For a trade that could profit if the stock price doesn’t move, you might consider using options. The classic neutral options trade is the iron condor—a short OTM call vertical, and a short OTM put vertical, in the same expiration (Figure 3). You take in a credit when you sell the iron condor. The speculation is that the stock price will stay above the short put strike and below the short call strike, and you hope to keep the credit as profit. 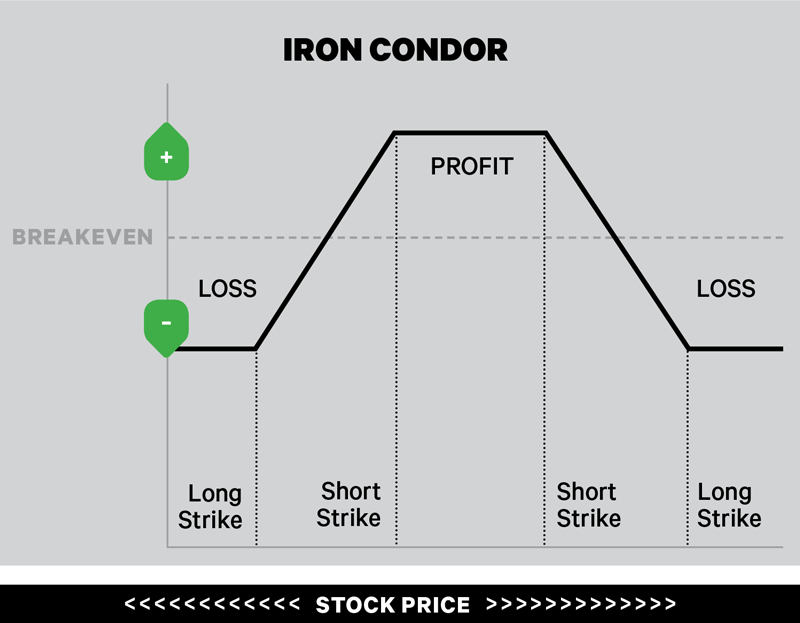 If you think a stock or index may move within a narrow range, you could consider an iron condor. Its potential profit and losses are limited. For illustrative purposes only. For example, if the stock price is $100, an iron condor might be long the 96 put, short the 97 put, short the 103 call, and long the 104 call, for a credit of $0.35. The max profit is the $35 credit, less transaction costs, if the stock closes between $97 and $103 at the option’s expiration. The iron condor has two breakeven points: the short put strike ($97) minus the credit ($0.35) and the short call strike ($103) plus the credit ($0.35), or $96.65 and $103.35. The max possible loss is the difference between either the call strikes ($104 – $103), or the put strikes ($97 – $96), minus the credit ($0.35), which is $65 in this example. The max loss happens if the stock closes either below the long put strike, or above the long call strike at the options’ expiration. Although the max potential profit on the iron condor is limited, so too is the max possible risk. Because the iron condor has positive time decay, the position can result in a profit as time passes, so long as the stock price stays within a narrow range, all things being equal. A downside of the iron condor is that it’s a four-leg strategy that can entail substantial transaction costs, including commissions. Still, it’s a strategy that has the potential to make money through speculation that the stock’s price won’t move up or down much. These alternative strategies aren’t your only choices, but you can engage them if you’re not confident in your directional strategy. If you like the idea of lower risk, positive time decay, and higher chances of making money, then these other trading approaches might be worth the downside of lower potential profit and higher commissions. 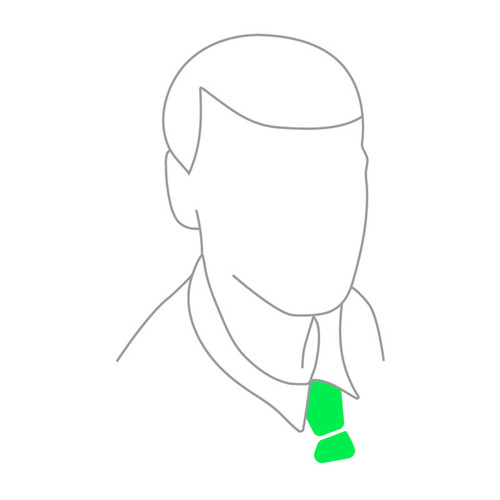 Thomas Preston is not a representative of TD Ameritrade. The material, views, and opinions expressed in this article are solely those of the author and may not be reflective of those held by TD Ameritrade, Inc.